[frame_right] [/frame_right]Reports are coming in explosions over the last 4 days have drained the Spent Fuel Pools, exposed and ignited Fuel Rods including MOX (Mixed Oxide Uranium/Plutonium). THIS MAY BE A HOAX! Information will be forthcoming I’m sure. If true, why now? Hint: 700 years ago the Council of Vienne stripped assets of the Cathar militia aka Knights Templars. The Laurel is growing green again. The seasonal Pacific Jet Stream moves south in the fall; essentially a 130-160MPH conveyor from Japan to the NW US coast and across the central US is now in place. Japan’s Minister of Trade Yukio Edano (allegedly) confirmed an explosion had occurred. In the last 18 months, the radioactive debris field has finally reached the West Coast of North America; Coincidental timing? Why at Fukushima? First, the Earthquake and Tsunami had nothing to do with the initial hydrogen explosions and subsequent fuel melting; that was caused intentionally by Siemmens coolant controllers. 5 layers of primary and back-up coolant pumps, passive steam powered circulation systems and nitrogen inerting systems all failed simultaneously; reminiscient of 10 shut-off valves all failing at Deep Water Horizon 1 year earlier. The Kuroshio “Black Stream” and Liman currents converge off the east coast of Japan. Like the Gulf of Mexico, this was the perfect location to “Destroy the earth”. Reference Rev 11:18; the 2nd Coming is to “Destroy them which destroy the earth” This is the occult version. The MOX Fuel used is a 6% Plutonium Oxide fuel made from re-processed weapon’s grade plutonium in the US at the Savannah River Site and by AREVA (Areva means “Center of the Heart”) in La Hague France near Normandie Beach (D-Day at Normandie was 700 years after the Norman Cathar executions). The fuel was designed specifically to mix with hydrogen gas and create neutrally buoyant “Bucky Balls”, picked up by Plankton, transmitted on Pacific Ocean currents to Alaska fisheries and the west coast of the Americas and up the Pacific Ocean food chain. Barack Obama delivered the fuel to Japan in 2009, bowing to Shinto Emperor and Knight of the Garter (essentially a Norman/Masonic Knights of the Round Table group iin the City of London) Hirohito Akahito, the youngest son of 330 Mason Hirohito, the Causus Belli for 330 Mason Harry Truman’s decision to test Uranium and Plutonium Atomic weapons on Japan. 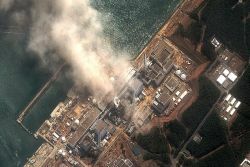 Reactor #3 was fueled in Sept 2010 with the deadly fuel and 6 months later on Lent “Hell broke loose” when Seawater was used to flood the reactor vessels. Japan is the “Land of the Rising Sun”; Fukushima sits on the 38th parallel. Pythagorean Geometry used in Geodesy “Earth Measurement” is based on a 3-4-5 Triangle representing the occult Trinity “Father, Mother, Son”, seen in the Federal Triangle, the Great Pyramid and its “King’s Chamber”; roughly 900-520-380 Obama’s claimed birthplace at 21.60 Latitude reflects the cubes of 33 + 43 + 53 ; 63 as well as the basis of the 2160 year Earth Precession ie Obama is heralding the “New Age” of the Rising Sun “Lucifer”. The Korean DMZ is also on the 38th Parallel; the UN sponsored war ended in Armistice meaning a sequel was planned. The “Silk Road” runs from the 38th Parallel across China to the Himalayas, down the Karakoram Highway to Islamabad, across Afghanistan, Iran, Iraq and Jordan. The “Great Work” is all planned to facilitate the arrival and acceptance of Lucifer as an alternative “Messiah”; one that Mitt Romney, Benjamin Netanyahu and Mahmoud Ahmadinejad have all professed their allegiance with; Jesus Christ? No way. “But as the days of Noe were, so shall also the coming of the Son of man be” Mat 24:37 They came from the east to build Babel and will come from the east to finish it (Gen 11:1KJV). “They” came along the same route. Knight of Malta aka Hospitaller Leon Panetta is warning a “Cyber Pearl Harbor” taking out Banking, Transportation and Power Grid is imminent. 7 of 10 Asian Nations are abandoning the $US in favor of the Chinese Yuan including South Korea. Pakistan is suing the American CIA and Drone Pilots for War Crimes and considering severing of Diplomatic ties. America discovered to be arming the Free Syrian Army as well as the Libyan Islamic Fighting Group, both al-Qaeda franchises associated with the Muslim Brotherhood. SCYTL whose major investor is George Soros and Bain Capital is contracted to count US votes from Barcelona cast on E-voting machines made by Hart Intercivic, a wholly owned subsidiary of HIG Captial, itself owned by Mitt Romney’s Bain Capital. Mitt is a 4th generation Mormon sworn to avenge the blood of his ancestor Parley Pratt and the Mormon Prophets on America. If this report on Fukushima proves to be true, America “Fat Man” is about to be showered with Plutonium, the most toxic man-made material on earth in what may be the ultimate act of “Revenge” for the Manhattan Project Plutonium bomb “Fat Man”. Remember Prince? He changed his name to the Ankh symbol, a Solar Cross from Egypt. He sang Purple Rain at the Superbowl the year Obama was Innaugurated; the song is about Uranium Oxide turning the sunset purple on its circuit around the earth. J Robert Oppenheimer said “I have become Death, the destroyer of worlds”; seems he and Prince were right. Eid al-Adha begins Oct 25 after the Hajj. The “Feast of Sacrifice” is celebrated by both Sunni and Shia Muslims as the willingness of Abraham to sacrifice Ishmael (Bible of course states Isaac was the sacrifice). This Quran story is familiar to Mormons like Mitt Romney who believe Ishmael’s descendants traveled on Arks to America with Zedekiah’s son Mulek. Remember folks, Jesus Christ is the Word; trust Him and the Word. In scripture, Zedekiah’s sons were killed (Jer 52:10; 2 Kings 25:7; Eze 17:16); there was never any Mulek; his name is simply Mlk the Arabic form of “Lord”. Wrong “Lord” folks! Oh almost forgot, Mitt Romney is a Romani Gypsy, part of “They” who came from the East to Babylon.